Crenellated towers and old houses with stone loggias and doorways, Bienno has maintained its medieval features intact. In the centre of the village is the church of Santa Maria Annunciata with frescoes by Romanino and Da Cemmo and the Parish church with the 17th century organ made by the Antegnati brothers, one of the most perfect in Europe. However, the real curiosity of the village is the old forges where the visitor can see how iron used to be worked using only hammers powered by the rush of the waters. Once there were over 80 forges in the valley and today the methods of three hundred years ago are used in Bienno. In fact the local smiths still use the ancient methods of working. To know the history of the old forges the visitor can go to the Ethnographic Museum of Ironworking, Arts and Popular Tradition. 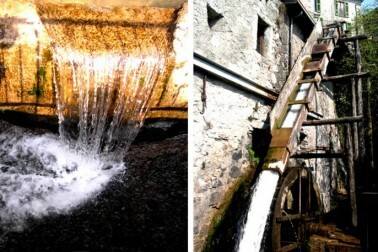 There is also an old mill in use to grind the grain into flour. Once upon a time this tiny village was the “Civitas Camunorum”, the centre of the valley’s affairs during Roman times. Archaeological remains bear this out (baths, theatre, houses, burial grounds etc.) but, more importantly, also the valuable finds now on display in the Archeological Museum. There are floor mosaics, vases, sarcophagi and a rare statue of Minerva made from Carrara marble, almost 2 metres high and dating from the 5th century B.C. Sitting in the centre of a sunny hollow, Borno is one of the most appreciated tourist resorts in Valcamonica. In the winter the visitor can ski from 1700 m on Monte Altissimo (see “Sport”) and in summer there are dozens of walks and outings available, from simple strolls to difficult climbs. Its historic centre is very beautiful and there are many typical shops. Five kilometres away in Ossimo is the 15ht century Convent of Annunciata with its harmonious cloisters and church frescoed by Pietro Da Cemmo. The road over to Val di Scalve has magnificent views.